In today’s economy, young adults are increasingly disconnected from employment at a time when the business community is in dire need of talent. Half of employers are unable to fill vacant positions and only 11% of employers feel newly credentialed graduates are ready for work. Failure to address this challenge has resulted in record youth unemployment rates that at times were double the national unemployment rate. The cost to society is lost taxes, growing entitlements, and missed chances for advancing economic opportunity. To address this challenge, federal and state policies have increased the levels of investment in youth employment and career pathway initiatives that address both in-school and out-of-school youth. Corporate and private philanthropy are seeding new efforts to build a national movement of youth employment initiatives. There is also increased interest from employers given imminent retirements and a need to grow their talent pipelines. In fact, 65% of employers planned to hire newly credentialed youth in 2015, up from 57% the previous year. 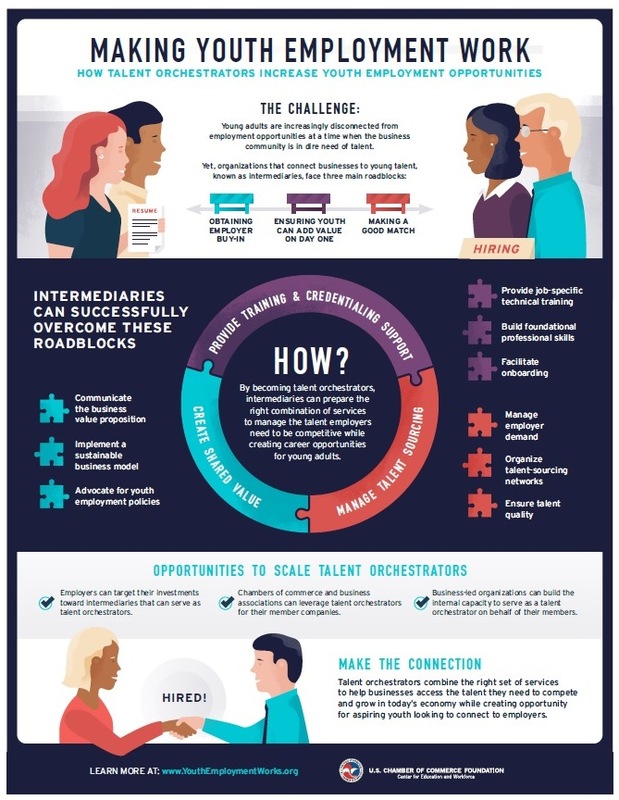 However, even the most successful youth-centered programs have experienced a common hurdle: scaling to meet workforce needs. Building on the 2015 paper Making Youth Employment Work: Essential Elements for a Successful Strategy, the U.S. Chamber of Commerce Foundation (USCCF) launched a Youth Employment initiative that is supporting employers and business associations championing scalable and sustainable solutions. In particular, this effort focuses on building the capacity for greater employer leadership and identifying promising practices for how the business community can more deliberately engage youth as an overall part of their talent strategy. Through this effort, USCCF is releasing a series of papers that highlight youth employment strategies that are not just demand-driven, but employer-led. This paper explores how employers and employer associations can leverage business-facing intermediaries as talent orchestrators to manage their human capital needs and scale youth employment efforts. It can also serve as a guide for how existing intermediaries can improve and scale in partnership with employers. First, the paper defines business-facing intermediaries and introduces a set of design principles for how this group can serve as talent orchestrators. Then it investigates how business-facing intermediaries are providing new opportunities for employers and business associations engaging in this space.